Saturday, Gramercy Guy and I had a busy day spring cleaning our apartment and running errands that at the end of the day, we just wanted to stay in and cook dinner. So we opened a bottle of rose from Unti and got to work cooking. We found Unti literally by accident, during a trip to California Wine Country. Talking with the sommelier at a winery, we asked her what was her favorite winery that we wouldn’t know about, she sent us to Unti and were fell in love. I highly recommend a stop there if you're in Healdsburg. Dinner always takes me longer to cook than I plan so I like to do an appetizer to hold us over. I made a caprase salad with fresh, handmade mozzarella from Eataly, an heirloom tomato, then I drizzled just a little bit of really good balsamic vinegar over it. On the side, I put some hot sopresatta and some sweet sopressatta, also from Eataly, with mixed olives. It hit the spot and got me ready to cook. I love to make fresh pasta, when you have the time; it tastes so much better than even the best boxed. When we got married, I registered for the Kitchen Aid pasta attachment thinking, if I never use it, I can return it. Well, I love it and use it often. I found a recipe in the New York Times for food processor pasta and I will never again make the well with flour and eggs again, and the best part, there is no mess on my counter. While the dough is resting in the fridge, I get a pot of water boiling, and prepare the rest of my meal. 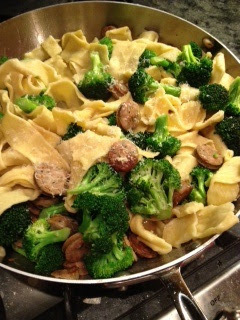 Tonight is simple, sausage (I used chicken cause it’s what was in the house), broccoli, lots of garlic and a touch of wine. After rolling the pasta into thin sheets, I cut them into strips; I wasn’t going to go fancy with shapes, put it into the boiling water to cook for 3 minutes. Drain, and save some of the water. Meanwhile, in a large pan, heat oil and add garlic, I like this pasta to have lots of garlic so I use 3 or 4 cloves, cut thick. Add, and brown the sausage until it’s crispy. This sausage happened to be pre-cooked so cooking time wasn’t very long. Add ¼-1/2 cup of white wine (I used some of the rose we were drinking) and the broccoli and cook until green and tender. Add the cooked pasta and ½ cup of the pasta water and mix well so the pasta is coated with the oil and whatever sauce is in the pan. If you’d like, feel free to drizzle some more oil on top. I serve with a generous amount of fresh shaved Parmesan cheese, and some garlic bread. For dessert, we only had to go to the freezer for the Ralph’s Italian Ices we had picked up earlier in the day.